Today, I had one more WWII related site I wanted to check off my list. To be perfectly honest, after visiting Auschwitz and Birkenau the day before, I wasn't sure that I wanted to spend anymore time dwelling on that dark part of history. 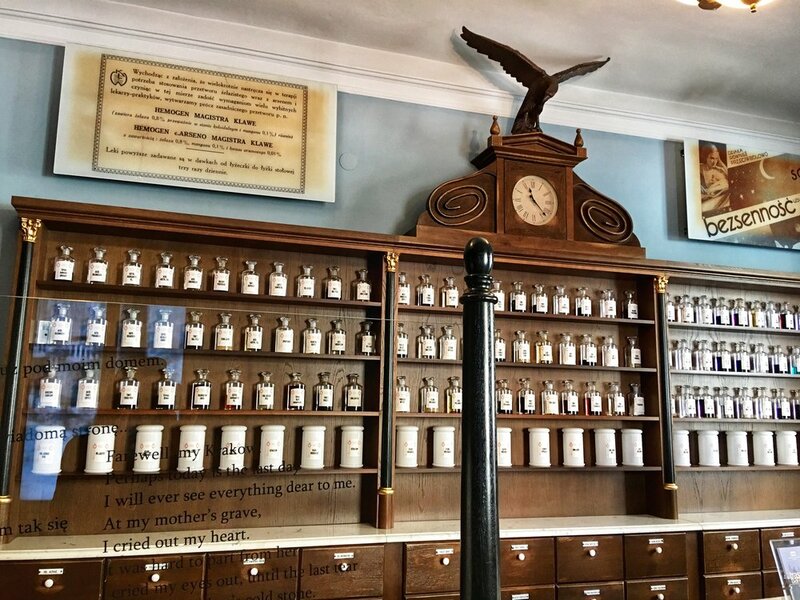 Still, I had been told that the Museum Pod Orlem was a “must-see;” so I headed back to Heroes’ Square, to the museum and former pharmacy of Tadeusz Pankiewicz. The museum is located at the far corner of Heroes Square, but you will have to purchase your entrance ticket just a few doors down (this happens to be the case for many of Krakow’s attractions). Once inside the old pharmacy, it took me a little while to realize that the museum is interactive. You’re supposed to open drawers and cabinets to find the additional information inside and if you don’t, you’ll miss the whole point of the museum. This information was posted on a small sign near the entrance, but the docent did not speak English and the lady at the ticket counter didn’t bother to explain the concept either. Once I figured out the way the museum functioned, I really enjoyed it. I thought it was even better than more frequented Oskar Schindler museum. The experience felt more authentic and the stories more personal. Pharmacist Pankiewicz was a Polish man who talked the Nazis into allowing him and his family to live and conduct business within the walls of the Ghetto. The support and supplies that Pankiewicz provided to the people imprisoned there was crucial to the survival of many. Even after the Ghetto was cleared and the inhabitants murdered or shipped off to death camps, Pankiewicz and his family took over caring for the pets that people were forced to leave behind. Tadeusz Pankiewicz gained nothing from the actions he undertook during those years, he simply did what he felt was his duty to his fellow man. If you find yourself in Krakow, I strongly suggest that you spend at least an hour here. After a good two hours inside the museum, I made sure to open every cabinet and drawer, I promised myself I would take a break from WWII history for a while. It was a nice day so I took the opportunity to walk along the Vistula River all the way to Wawel Castle. Along the way, I stopped to pay my respects at the statue of Dzok, who is essentially the Greyfriar’s Bobby of Krakow. The inscription below the statue reads, “Dzok, The Dog: The most faithful canine friend ever, epitomizing a dog’s boundless devotion to his master.” It is said that, for more than a year, Dzok faithfully waited for his master at a nearby intersection, which is the exact site where his owner had passed away. Next, it was on to the castle itself! Buying tickets here was a little confusing because there isn’t a single all-inclusive option. Entry for each exhibit is also timed. I was a little confused and worried I wouldn’t be able to see everything so I chose tickets for The Lost Wawel, State Rooms, and Armory/Treasury. I missed the private apartments, tower, Lady in Ermine, and the Cathedral, which is separate from the castle itself. I also missed out on the audio guides somehow. I’m really sorry that I missed so much of the castle, but I suppose it gives me the perfect excuse to revisit Krakow in the future. 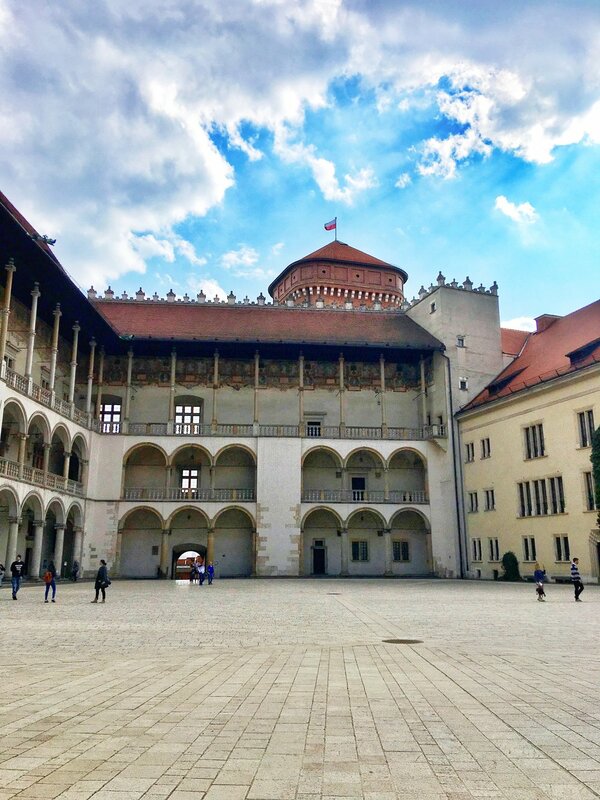 I was really impressed with what I did see at Wawel, and I’m not always enthusiastic about castles because I feel like I’ve seen quite a few of them already. I will say that this was certainly much more interesting than what I saw inside the Prague castle, nor are you herded through the castle compound like cattle. As an avid horseback rider, I really liked seeing all of the saddles and tack inside the armory; something that is rarely presented in such pristine condition. I did have to laugh at one particular display of a bit and bridle. I kept looking at it because I knew something was off about it. Finally, I realized that the bit was attached to the bridle upside down. In between a few of the exhibits, I took a break to enjoy a drink and a piece of apple pie. Polish apple pie is a little different from the American version I’m used to. It is served as a square slice, the crust is a bit more dense and the top is dusted with powdered sugar. The filling inside tastes more or less the same. After this, I went back down by the river to see Smok, the dragon, breathe fire before continuing my stroll around Wawel Hill and through Planty Park. I went all the way to the Barbican Gate, where the street artists display their wares. I spent some considerable time trying to decide, which piece of street art I liked best. There were too many beautiful paintings to choose from! I finally settled on a small piece that depicted a horse and cart in front of St. Mary’s Basilica. Nest, I stopped into the Harley Davidson store to buy my dad a t-shirt and pin. The store had some really neat selections and my dad was pleasantly surprised by the items I picked for him. Shopping done, it was now time to scope out a spot for dinner. I walked round and round the square looking at menus before finally deciding on Wesele. The restaurant had also been recommended by a blogger I follow, who had also recommended the pierogi shop I loved so much (thanks Merritt!). I had wanted to eat outdoors, but it appeared that a storm might be blowing in so I opted for a table at the large picture window instead. I ordered the potato pancakes (latkes) topped with beef goulash. I forgot this dish is typically served with yogurt on top, so when it arrived I did my best to discreetly scrape the yogurt to the side. The food was delicious and I thankfully didn’t experience any ill effects from the yogurt. For dessert, I ordered the vodka infused sorbet (the only dairy-free option), it was different from sorbet I’ve had previously, but I enjoyed the different flavors, which I think were strawberry, mango, and cherry. This meal was a splurge by Krakow prices, but I think it ended up costing me roughly $20 American dollars even with a generous tip. There are only a few days left in this trip report. How are you liking the report so far? Would you prefer more general location posts or do you like the journal type entries? I’d love to hear any and all feedback as it can help me decide on what direction I should take in the future. Thanks for reading!